When are you leaving? Hopefully next spring (2014). Our exact timing depends largely on our financial support needs being met. We are currently fundraising. Prior to leaving we must have our funding pledged for our first 3 years of service. How will you raise support? While some of our support will come from churches, a large portion will come from individuals who take an interest in being a part of this ministry. If you are interested in financially supporting our ministry, please go to the “You Can Help” page on this blog for more information. How long will you be gone? Our first term in Kenya will be 2 years. We are serving as part of the Missionary Discipleship program through World Gospel Mission, which will help prepare us to become career missionaries. After being commissioned as career missionaries, we will continue to serve ongoing terms with intermittent time spent at home. What do Rees and Mary Taylor think? The girls have mixed emotions, but overall seem excited about the adventure. They have heard that there are lots of chameleons, and already have plans to keep one as a pet! (Actually, Mary Taylor is asking for a pet snake, cat, and monkey as well; I think she is overcompensating a bit for not being able to take our dogs with us!!). Where will your girls go to school? Angela will likely be home-schooling Rees and Mary Taylor, although there may be a teacher coming to serve. If a teacher is able to come, it will free up more time for Angela to be involved in the medical ministries. Where exactly will you be living? Tenwek Hospital is located in the western highlands of Kenya in the small town of Bomet, which is about a four-hour drive from Nairobi. (And yes, that means four hours from a grocery store)! The landscape is made up of rolling green hills with scattered small farms. An adjacent river provides hydroelectric power to the hospital grounds (and may provide for some canoe rides, Heath hopes!). We will live in a house or an apartment close to the hospital. Have you been there before? 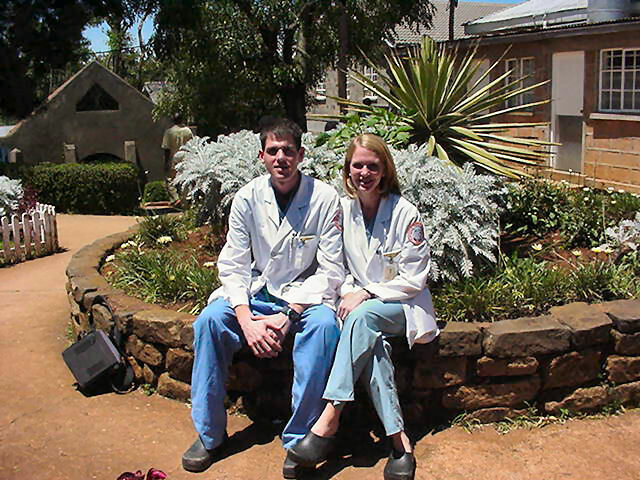 We spent our last 2 months of medical school (in 2000) working at Tenwek Hospital. The pictures on this post are the much younger versions of us at Tenwek 13 years ago!